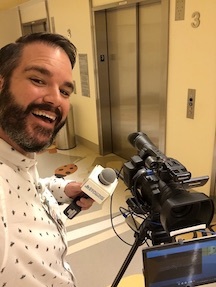 Seacrest Studios at Children's Hospital of Orange County has begun utilizing technology generously provided by Polycom to take the Seacrest Studio experience directly to patient rooms play areas. Coined the “Seacrest Studio Pop-Up Studio”, this mobile system was a big hit during their 6th anniversary celebration. Using an existing studio camera, a tablet, and the Polycom App studio managers were able to create a broadcast quality video feed back to the studio remotely. By tying this into the existing production switch, the studio was able to add graphics and other media to the shots while building an entire Green Screen experience (previously available only in studio) for patients in their rooms. 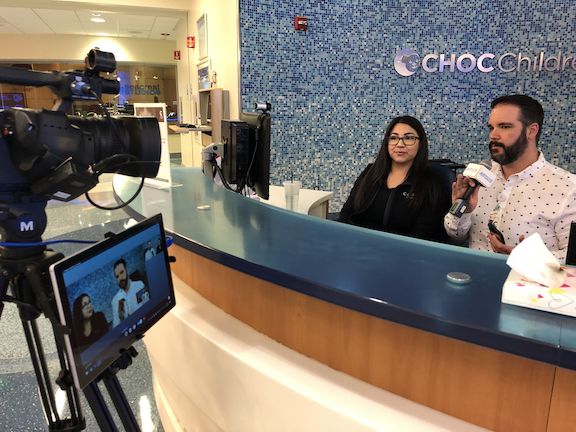 Seacrest Studios at CHOC Children’s plans on using this technology in the future for remote broadcasting from playrooms and other areas of the hospital to engage all patients - near and far. Following the birthday celebration, a patient unable to leave his room was playing Connect 4 virtually through this system. Upon seeing him on the screen, another patient ventured to Seacrest Studios hoping to join in. Due to health concerns, the two patients were unable to play together in the same room. This new system at CHOC allowed an isolated patient in his room the opportunity to meet a new friend, socialize, play game and be a kid for a while. Keep up the great work, CHOC!